Saying good bye to Maxine is one of the hardest things I am having to do. For those of you who followed me in the beginning, Maxine lived across the street from me. Of course that is not her real name, but she acts so much and looks so much like the Maxine cartoon that I started calling her that. She and her husband moved to a retirement community in early January. It is only about eleven miles down the road, but it may as well have been 100. I was feeling my worst and not doing much other than keeping doctors’ appointments and shopping for groceries. Driving that far if not medically necessary was too much of an effort. Maxine is in her early 80s. Her husband is 93. He has been having health difficulties with his blood for many years. It affects his energy and his cognitive abilities. For a while he was doing quite well, but for the past couple of months he is once again going down hill. Maxine dotes on him like a mother hen. Such dedication among married couples is not exactly common. They invited me to lunch about a week ago. It will probably be the last time I see them. They are now living in a lovely retirement community. Their’s is a two bedroom apartment on the first floor. I’m not sure what the age range is, but the diners all looked approximately the same age. I had looked into such communities within the last year, but I think I’ll wait about at least ten more years before I make that move. Alice has intentionally lost about twenty pounds and is looking quite healthy. She seems more filled with energy now that she is not taking care of her big house. Of course with the energy she has, she has met and knows the name of almost everyone in the building. She introduced me to about twenty diners as her neighbor while I was there. After lunch we went back to their apartment. Her husband was very tired so he excused himself to take a nap. She and I talked about ten minutes more before I headed down the road again. I never have felt at ease to talk in person. It is much easier for me to write. 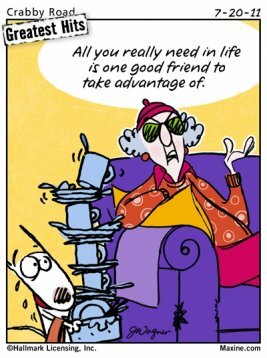 I love Maxine and will miss her greatly. I never learned that to tell Maxine was to tell the entire neighborhood. She would just mention my affairs to a couple of her friends but she just knew they wouldn’t tell a soul! I don’t remember being especially that much taller than she, but when I hugged her good bye, her head came to my breast. I have no idea when she started shrinking. She certainly hasn’t stopped talking. I will always think God put me in this neighborhood for a reason. My son was six when my ex left. Next door we had Grandma Annie and Grandpa John. John died when my son was in the first grade. Grandma Annie passed away when he was in middle school. The couple across the street from them and their daughter all died in the following years. Maxine was always there whenever I needed some help. She’d cook too much and bring over supper pretty frequently. Now Maxine and her husband have moved. I once stayed in this house because I didn’t want to leave the village that was helping to raise my son. Now my son has no desire to return and the village people who meant everything to me has gone. Whenever I see videos like this one I am so moved by the idea that all creatures are capable of love. How could any scientist or animal behaviorist prove else wise? I’ve seen it in dogs staying with owners who are injured or other dogs, ducks who remain with mates, cats who adopt baby bunnies…You Tube is filled with such videos. How can we be so blind as human beings not to notice relationships around us because “only humans have spirits”? Shirley and Jennie were truly fortunate to find each other. It is the story of a friendship that never died. Their undying love for one another is obvious. It is a very moving story. Shirley’s handler must have had a feeling of pride beyond anything I will probably ever feel when he said, “I don’t know who the first one was to put chains on Shirley but I am the last one to take them off.” What a blessing to know you helped free another sentient being. 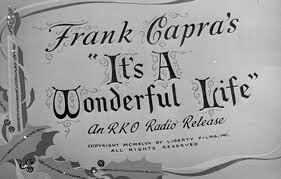 One of my all time favorite Christmas movies is “It’s a Wonderful Life” by Capra. I’ve seen it many times over the years. I was pleased to see that it is being shown in four theaters in the Fort Worth area today. Followers of this movie are increasing. Unfortunately I cannot attend any of them because my Christmas Eve celebration starts at 5:30 with a dinner with a friend and her family and then 7:00 candlelight service. It is sad to me that NBC has sole rights to the showing of this film and only shows it once at 8:00 p.m. I will be able to make it home in time to see part of it but I’ll miss about the first half hour or so. I often wonder why I enjoy this movie so much. It was pretty much panned when it was first out so many years ago. I’ve come up with several reasons. It was released in 1946 the same year I was born. It gives me an insight into how people lived over sixty years ago. Life was so much simpler then but the problems of living day to day have really not changed all that much. Kids still get sick, young people start out married life with little money, parents still get mad at teachers, corrupt people still try to control their towns….etc etc etc ad nauseum. I guess that is because we are human. We can’t seem to get beyond the day to day problems of just living. I love the idea that guardian angels can intervene in our lives. Based on situations I have found myself in, I have no explanation other than the protection from my guardian angel that I emerged without harm so many times. Many times throughout the years I have wished I have never been born because I have seen myself as a very insignificant being on this earth. Then I would think about the baby I rescued in the pool, and the very angry young boy in summer school who learned he could understand math if we went back to the point where he did know what to do and proceed from there. He was going into sixth grade ( a year behind) and was in a third grade remedial math class. He had an attitude in the beginning that was downright scary. The last day of the program he came back into the room where I was alone. For a second I was fearful but then he put his arms around my neck and gave me a big hug and thanked me. Then he turned around and left again. I will never forget that hug. I think about the patients when I volunteered at the hospital who were grateful that the only thing I did was listen to their heart wrenching stories. I think about the parents and former students I come in contact with occasionally who still thank me for the way and what I taught. They tell me now of their successes. Most of all I think about my son. A son who has no logical reason for being able to be here. I was married to a traveling salesman who was gone from Monday through Thursday nights and often spent Friday and Saturday nights at the bar. I was told for many years that because of my anatomy It would be improbable that I would ever be able to conceive or carry to full term. Yet there he was. I had no indication he was even with me the first trimester. When he arrived, I was only in hard labor for about four hours. He arrived at 7:00 A.M.on the day he was predicted to be born after four hours of labor. His estimated date of arrival was a sheer guess on the part of the doctors. That’s kind of off the track but my point is I heard Jim Carry say of his mother that her life was significant, even though she was plagued much of her life with illness, because she had given birth to someone who was significant. That thought has resonated with me. My son is a significant person and the child that is expected in June will be a significant person as well. I am learning the value of true friendship. I have never had many friends in my life who I “hung out with” to do things socially. I was never a part of a group in any years in my school life like so many girls. I was an outsider. But over the past few years I have developed friendships that I feel I can count on if I ever really needed help. I think they would come through in a time of emergency just like in the movie. It’s Christmas! Time for more White Elephants! I’ve written several Christmas posts. It’s amazing since I don’t have that much to say about it. Things don’t change that much year after year. I’m going to my first of three Christmas parties tonight. It’s with the same group of women who hold a potluck dinner at church every month. It’s strange how I can meet with them month after month and still not be what I consider real friends with them. That month after month has been changing lately to maybe three or four times a year. These are all nice ladies but with the exception of one, there is no communication between any of them and me. We don’t call each other or do any other socializing together. There is an overlap with another lunch bunch of some of the members so I see three or four of them twice a month if I go to both groups. Tonight we will be having our gift exchange. Everyone brings a gift she wishes to recycle and puts it under the tree. We then draw numbers which match numbers placed on the present. There are several names for this “game” we play. We may choose a present from under the tree or take a present from someone who has already opened one. The one who goes first gets last turn to take anyone else’s present. I think we call it White Elephant or Chinese gift exchange. Now that my daughter in law is Chinese, I don’t think I will be calling it that anymore. Anyway, I have finally figured out a system. Even though the gifts are recycled, they are still fairly nice for the most part. It’s just that I don’t seem to see much of a need for them. Thus, I will probably take the gift I get tonight to the next party and then take that gift to the third party. The gift I bring home will probably go into the closet to wait for next year unless it is something I can really use. This type of gift exchange occurs at all three of the parties. For some reason my acquaintances all get (or pretend to get) a big kick out of “stealing” desired gifts from others. I guess if I were more materialistic, I might get more enjoyment out of such frivolity. Almost all of my holidays are times to be alone. That in itself is a mixed blessing. I tire of small talk quickly and really have to work on not portraying disinterest. 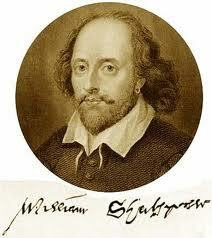 It takes me ten minutes or less to write five hundred words. It takes me a half hour to say them. One of my acquaintances with whom I am getting somewhat closer admitted the same thing. She is in a worse position than I since she has to market her own “company” of one, her services. She admitted how much she dislikes small talk as well. She won’t be there tonight. I could talk to her. I also have a free pass from having to deal with impossible relatives that everyone seems to have. Family gatherings are often reported with a sense of dread. I had a few of those dreadful experiences myself. That will be mainly it. Chit chat until everyone arrives and the table is filled with an assortment of foods, praying in, eating, gift exchange, and praying out again. We are nothing if not predictable. My gift is a very heavy coffee table book of pictures of Japan. A friend of mine gifted it to me during that time when my son’s romance was with a young woman from Tokyo. It really does have some lovely pictures in it, but seeing as how my son is now married to a Chinese woman, I am trying to divest myself of all things Japanese. Yoko’s parents were quite generous in the gifts Nathan brought home with me so I certainly have a large supply of possible gift exchanges. I am counting on on my friend to not be there tonight either, but if she is, I hope she’ll understand the reason for recycling the book. Comments Off on It’s Christmas! 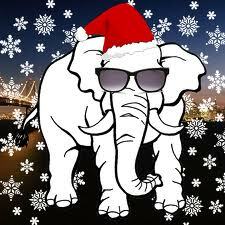 Time for more White Elephants!